Thank you for a great year in 2015! With your help, we made great progress in 2015 in building a grassroots movement in the Rogue Valley and beyond for climate action and a faster transition to cleaner energy and energy efficiency. I’m writing to ask for your support to expand on that work in 2016. Lease the Bottom of Coos Bay for a Private Pipeline? No Way! The Department of State Lands extended the deadline for some permits (see below), but not for this part! The Jordan Cove Energy Project is proposing to lease the bottom of Coos Bay for a massive fossil fuel pipeline that would feed the proposed export terminal that hopes to ship fracked gas from the United States and Canada overseas. 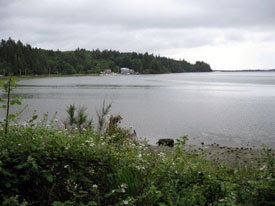 The bottom of Coos Bay - in this case Haynes Inlet - is an area that is managed by the Department of State Lands and owned by all Oregonians. Jordan Cove is one of the largest projects proposed in Oregon's history, and would dredge, drill and fill through 400 different waterways. This highly unusual and controversial proposal would lease an easement on public land for the benefit of a private Canadian company, at the expense of oysters, fishing, recreation and other values that Oregonians rely on. Take Action: Please let the Department of State Lands that there are better uses for Coos Bay than exporting gas! Local photographer David Lorenz Winston was hiking the shoreline of Emigrant Lake when he saw a trickle of water reaching the depleted lake. "Emigrant Lake was almost depressingly low," he recalled. "I took a wide angle lens and used it to emphasize that thin rivulet." The No LNG Export campaign is crowd-funding an ad to run in the Oregonian this Sunday, asking Gov. Kate Brown to Stand with Oregon and say no to LNG Exports. FERC has released their final Environmental Impact Statement, and the next month is critical for Gov. Kate Brown challenge FERC's decision and to make sure the state considers the devastating impacts the federal government ignored and that should prevent the LNG Projects from going forward. Every dollar helps!